I’m confused. Do I want a light summer breakfast that involves no cooking? Or do I want something more savory and substantial? We are still technically in summer’s embrace/clutches but June (and our “wet” season) is already around the bend and a typhoon supposedly ready to drop the ax on our shores. Outside my window the weather seems likewise confused. Sun peeking through the clouds, alternately becoming overcast then back again. What’s it to be? When it comes to breakfast, when in doubt, the answer is always eggs (in my book at least)! They are a fantastic source of protein, have the ability to be a meal unto themselves, and, most importantly, are absolutely delicious. Golden, runny yolk, sprinkled with salt, and mopped up with buttered toast is one of life’s most sublime offerings. And now that I’ve found a new favorite way of having them, all the more reason to have eggs on this wishy-washy-weather morning. I “discovered” pimenton fried eggs one day while making these Chickpeas & Sweet Potato Greens. I was going to have it for lunch and needed something to round it out into a meal. A fried egg is my usual standby in cases like this, but I turned a saw my little tin of Pimenton de la Vera and the wheels in my head would not be stopped. – Heat the olive oil in a skillet. When the oil is hot add the pimenton, leaving some for sprinkling later. – Swirl the pan so the pimenton spreads and the oil takes on a red-orange hue. The smell will be amazing, be ready for weak knees. – Add the egg and let this fry. When the whites are set swirl pan around carefully so the orange oil gets on the whites. Sprinkle remaining pimenton on the yolk. Sprinkle sea salt all over the egg, being more generous with the yolk. I like to take mine out when the yolk is still quite runny but by all means cook it to your preference. Pimenton de la Vera is a Spanish smoked paprika. It is made in La Vera, Spain, from local peppers that are smoke-dried and then ground. It comes in dulce (sweet), agridulce (medium spicy), and picante (spicy). I use the dulce variety here as, honestly, it’s my favorite. You can use a mixture as well of dulce and picante if you want more heat. Authentic pimenton de la Vera comes with a D.O. (denominación de origen) and it is well worth it to seek a proper one out. Pimenton is one of my favorite spices and definitely a pantry essential in my home. Its smokiness is deeper and more pronounced than regular paprika and it adds a very distinct Spanish flavor to any dish you add it to. It is essential in my fabada and callos, and works very well with any dish involving a tomato-based sauce. This very simple preparation highlights all that is good in its three main ingredients, so don’t skimp! The earthy smokiness of the pimenton, the richness of the egg, and the flavor of the olive oil. Don’t forget to salt the egg as it fries. I ate this atop some spinach and rösti potato**, but really this would be great with many things, not the least being a piece of toast. As I look out my window, the sky still seems a bit unsure of itself (although I did hear a peal of thunder just now and the scent of rain is in the air). I on the other hand, glancing at my breakfast plate that is all but licked clean, am no longer confused. This is, for certain, one of my favorite ways to prepare egg in any weather. **Just in case you were wondering: For the rösti, peel and grate a small potato. You should have a scant cup of grated potato. Fry half a white onion, sliced. When the onion is soft add to the grated potato. Heat oil in a non-stick skillet and when hot add the potato and onion mixture. Press down with a spatula and fry until the underside is golden, pressing the rösti every now and again. Flip the rösti and fry the other side until golden as well, continuing to press on it once in a while. For the spinach just blanch a handful of it in boiling water for a minute then drain. P.S. It just started to rain! Joey it does look delicious. I had not heard of this style of pimento before. Interesting. Wow that egg looks amazing. why dont you visit 'wefeedback' and share your meal to help children around the world. Thats one tasty looking egg. That looks awesome! I have a small tin of pimenton in my cupboard too. I can't wait to try this. Thanks for the Rosti recipe too. DROOL. how perfect is that combination!!! Hi Mieke! Hope you like it! That tin is one of my pantry must-haves! I love eggs for breafkast and also adore pimenton. I am taking a look at your callos recipe right now! OMG that looks delicious! Thanks to you, now I'm craving eggs for dinner! what a great idea! I love smoked paprika, too! i have been obsessed with fried eggs lately and this version looks so interesting and delicious! As no one else seems to have noted, let me clarify: You are not confused. You are brilliant! What I need now is a little can of Pimenton de la Vera! … Ho, I found one in the pantry. 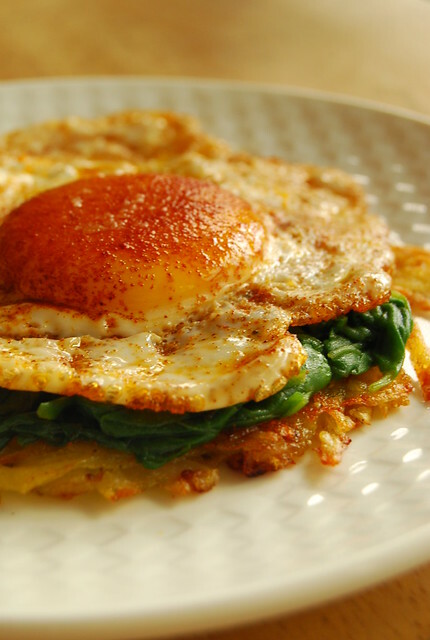 How can I resist: egg, spinach and rosti!! This looks delicious. Eggs can do no wrong in my mind. Ever. Very interesting! It looks great! Hi Rachel! It’s simple too and so flavorful, and you can pair it with so many things…hope you give it a whirl! Hi Natalya! So true that! Hi Alisa! Enjoy the pimenton…it is really fantastic! I never realized how simple it was to make rosti until actually started making it! amaizing eggs! love your pictures! could you tell me where i can get good pimenton? is there a particular brand you recommend? wow! what a fun breakfast! I love pimenton as well and have been using it more and more in the kitchen. And now, I'll be sprinkling some on my eggs too. I love fried egg. It's look so delicious. A new way to eat fried egg for me. Not always dark soy sauce only. Delicious! Fixed this for brunch today — no potatoes, just toasted bread in EVOO in the skillet first. So simple & different. Thank you!